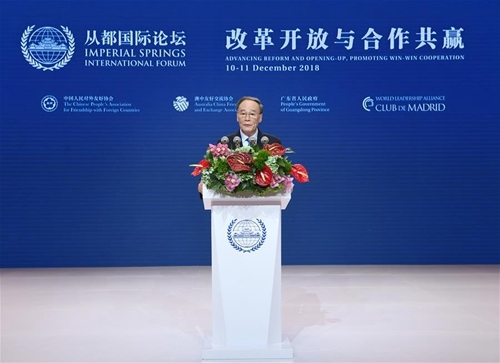 The remarks came as Wang attended the opening ceremony of the 2018 Imperial Springs International Forum in China's southern city of Guangzhou. 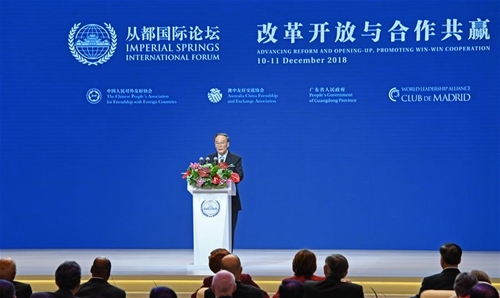 Some 200 former world leaders, renowned scholars and business elites gathered here to exchange their views on "Advancing Reform and Opening-up, Promoting Win-win cooperation". This year marks the 40th anniversary of China's reform and opening-up, which, according to Wang, is a glorious chapter for the Chinese nation's great rejuvenation history, and not only profoundly changed China, but also deeply influenced the world. Reviewing China's reform and opening-up, Wang stressed that the process is linked to the exploration and practices of socialism carried out 30 years before 1978, the history of Chinese people's struggle for national rejuvenation since 1840, as well as the sufferings and glory of the Chinese nation over the past 5,000 years. "The sufferings and glory of history are the source of the present," said Wang, adding that socialism with Chinese characteristics has entered a new era and the Chinese nation is closer to the goal of great rejuvenation than any other time in history. He said the door to China will never be closed and will only be opened wider and wider, and this is a strategic choice based on China's development needs. China will firmly adhere to its own path, work in a down-to-earth way on its own tasks, continue mutual learning and cooperation with other countries, build a peaceful world, contribute to global development and maintain international order, Wang said. Noting that the interests of countries around the world are deeply intertwined nowadays, Wang said China will be committed to the path of peaceful development, uphold new forms of international relations featuring mutual respect, fairness, justice and win-win cooperation, and build a community with a shared future for humanity featuring lasting peace and common prosperity.